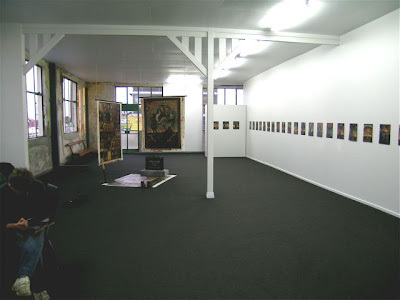 HERE'S THE FIRST OF A FEW INSTALLATION SHOTS OF MY NEW EXHIBITION, 'THIRTY-THREE' AT PAULNACHE IN GISBORNE. IN THE FOREGROUND IS MARK BRAUNIAS TOUCHING UP A PAINTING. OPENING'S TOMORROW NIGHT- HOPE TO SOME OF YOU THERE.